Caenorhabditis elegans is a small (about 1 mm long) soil nematode with a transparent body. The fact that the internal structures can be seen during all stages of development has allowed it to generate the complete cell lineage for C. elegans for all of the about 1000 cells. In addition, the complete wiring diagram of the nervous system has been elucidated. Thus, it has become a model organism to study the genetics of development and neurobiology, and since 1998 the complete genomic sequence is available. In 2002 the Nobel prize in Physiology or Medicine was awarded to three key researchers in the worm field, Sydney Brenner (founder of the field), John Sulston, and H. Robert Horvitz. In 2006, Andrew Fire and Craig Mello were awarded the same prize for their discovery of RNAi in C. elegans. In 2008, Martin Chalfie shared the Nobel Prize in Chemistry for his work with GFP in C. elegans. To look at some worm movies, go to the C. elegans Movies page. We are interested in how cell fate and cell differentiation is regulated. Our particular focus is head and brain development, although some of our genes have interesting functions in other developmental processes as well. Two specific groups of genes are being studied: Homeobox genes and the hedgehog-related genes, named warthog and groundhog. Homeobox genes are transcription factors that are well conserved in evolution and have been shown to play pivotal roles in many developmental processes. The warthog and groundhog genes are structurally related to the fly and vertebrate hedgehog genes, which are important signaling molecules. We employ 4D microscopy techniques for studying gene expression patterns and are developing novel software tools for analyzing, storing and modeling C. elegans gene data. The Endrov Imaging Framework is now published in Nature Methods (June 2013). 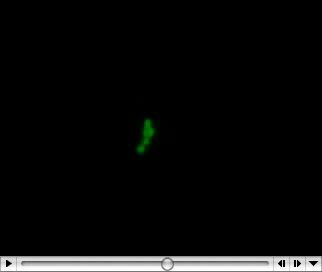 Click on the image to see a GFP movie created using our 2-channel 4D microscopy that allows us to monitor life GFP expression.